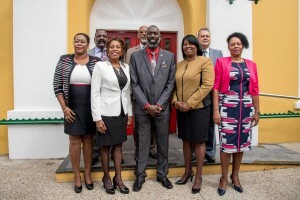 WILLEMSTAD - Gilmar Pisas was just sworn in as Prime Minister of Curaçao. The party of the convicted former Prime Minister Gerrit Schotte returns to power thanks to the appointment of his party colleague as head of the interim government. According to Schotte, Pisas’ appointment is just temporarily. Pisas will have to make way for Charles Cooper who has not yet passed the screening process. Schotte himself did not make any attempt to be a minister because he will not pass the screening. But the former prime minister is the leader of the coup that tumbled the former government of Hensley Koeiman only fifty days after its inauguration. The new interim government Pisa's, consisting of ministers from Schotte's MFK, Korsou di Nos Tur (KdNT), Movementu Progresivo (MP) and two independent MPs means that the parties which are now in power are much more critical towards the Netherlands. According to Schotte, the Netherlands has suppressed the island through the judicial system. Also, the leader of the KdNT, the businessman Amparo dos Santos is in favor of a total independence of the island. Officially the interim Prime Minister Pisas is only minding the store for a while and to ensure that the new elections take place in late April. Schotte, however, has indicated that he does not want elections. If it were up to him, his new team will stay in power. But the elections cannot be canceled. It is the first time since Schotte's tumultuous resignation in 2012 that the controversial politician again represents the most powerful governing party in Curaçao. In September of that year, he locked himself in the government building Fort Amsterdam before finally giving up power.